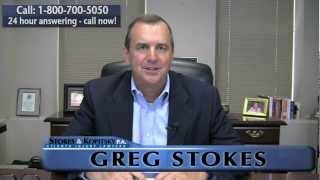 Case Results | Stokes & Kopitsky, P.A. $3.3 Million Truck accident – failure to yield the right-of-way by a truck driver resulted in the wrongful death of a mother and serious injuries to her children. $528,000 Head injury – structured settlement for a client who suffered post-concussive syndrome following a rear-end car collision. $900,000 Pedestrian accident – client was struck by a pickup truck at a car dealership resulting in neck and back injuries with multiple surgeries. $8.5+ Million Catastrophic injury – multiple vehicle high speed collision caused by failure to yield at intersection resulting in serious and disabling injuries. $314,500 Broken ankle – client suffered a foot fracture with surgical repair as a result of a failure to yield car crash. $550,000 Driver on cell phone – company driver on a mobile phone causes high speed rear-end impact resulting in neck injury with surgical repair. $1.75 Million Wrongful death – a negligently hired defendant who had a prior history of accidents caused an accident which resulted in a wrongful death. $385,000 Bus/Car collision – city bus crosses center line resulting in a head on collision with automobile causing multiple fractures with hospitalization. $700,000 Forklift accident – a postal worker loading a tractor trailer truck was injured and suffered trauma to neck, back, and shoulder. $1.8 Million DUI driver – intoxicated company driver (3rd DUI) crosses center line resulting in a head on collision causing serious injuries. $675,000 Products liability – automobile defect caused the unexpected movement of a vehicle from park to reverse. $850,000 Staircase fall – defective steps at an apartment causes the heel of a shoe to catch on the metal lip of step resulting in a fall with injuries including a fractured jaw and broken teeth. $1.15 Million Negligent daycare – failure to supervise children at play resulted in traumatic brain injury. $330,000 Construction worker – improperly installed safety railing causing construction worker to fall off a building resulting in a shoulder fracture. $515,000 Rental car accident – serious injuries including a femur fracture as the result of a two-vehicle collision. $1.8 Million Police shooting – client suffered multiple gunshot wounds by improperly trained employees. $464,000 Night driving collision – driver falls asleep at the wheel causing a head on collision of two tractor trailer trucks resulting in traumatic injuries. $750,000 Pulpwood truck – improperly operated pulpwood truck with multiple DOT violations. $1.3 Million Brain injury – an industrial accident resulted in a closed head injury. $425,000 Injured policeman – truck jack-knifes into police vehicle causing trauma to a police officer resulting in post traumatic stress disorder. $180,000 Dog bite – an 11 year old suffered from post traumatic stress disorder as the result of a pit bull attack. $1,056,000 Truck accident – aggressive driving by a tractor trailer driver resulted in a collision with car causing a serious low back injury with multiple surgeries. $250,000 Neck injury – two vehicle collision causing a serious neck injury that resulted in surgery. $985,000 DUI driver – company driver under the influence of cocaine crosses the center line causing head on collision resulting in serious injuries. *These are not the results everyone gets and there is no guarantee of results similar to those shared.